You are here: Home / Food Truck / Have You Considered A Food Truck Startup? You may have seen them at construction sites, office parks, empty lots, or at popular tourist locations. You may live in a community where they sit at specific locations in the downtown core. What you can’t ignore is the smell of something delicious coming out of a food truck. In addition to that, you can’t ignore the part-time income possibilities that can result from a successful food truck startup. You don’t even need to have a full menu. What makes the food truck industry so attractive to people easing into retirement is that they can be successful with just a few food choices. one couple in my area specialize in toasted cheese sandwiches and delicious homemade soups. Another cooks only traditional “comfort food,” such as Hoppin John. In addition to not having the overhead that comes from operating a full size restaurant and dealing with staffing issues, a couple can live quite nicely with the income from a part-time food truck business. Here is some math to show you that this growing trend is worth looking at. The street food business is a $1-billion industry that saw an 8.4-percent increase between 2007 and 2012. The numbers, from IBISWorld an industry research firm in Los Angeles, go on to show that 78-percent of the food cart and food truck businesses are operated with four or less employees which makes this a perfect match for a part-time entrepreneur. Identified collectively as the mobile food industry, this growing opportunity is seeing an increase in growth based on two solid reasons. First, with a slowing economy the average person is more interested in a quick and affordable breakfast or lunch to match their budget. Second, with the average employee facing shorter lunch breaks and more workplace demands, a fast and easy ‘grab and go’ style meal is becoming the norm during work hours. What makes a food truck startup more attractive to the entrepreneur is the mobile state of the business. That is to say, if one location doesn’t work well, it is far easier to move and park somewhere else, even if your municipality requires permits and has designated mobile food service zones, with a truck or cart than if you were in a restaurant building. But before you plunge into the mobile food industry you will need to do a bit of homework as well as closely examine your abilities. For example, does your community allow food trucks to operate within city limits and if so, what are the procedures required to have a designated location, permit and licensing costs. Plus, you will need to decide on what you will sell (your menu) and if you intend to be part-time or full-time at it. If you have experience operating a small business, you will already have an advantage just as you would if you were a restaurant owner or worked in one. You will also have to decide what size of mobile food service you are prepared to operate. Your choices are a food kiosk, food cart or a concession truck. Each has advantages and disadvantages. Kiosks are simple in that they can be assembled and sit where you put them. They are large enough for two people to work comfortably and are great for outdoor vendors who have seasonal products or only wish to sell during the warmer months. Food carts and concession trailers are larger and have more room for supplies, equipment and related items. 1. Can you prepare it easily in large quantities? 2. Does it taste consistently good? 3. Is it easy to serve? 4. Does it travel well? As for costs of a food truck startup, a used hot dog cart could be $2,500 or less. 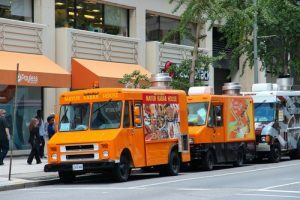 A used food truck with updates can cost $30,000 plus with a new food truck running in the $100,000 range. But there are ways to extend the mobile food service season by expanding into the more profitable mobile catering business. If your menu is more along the lines of gourmet food, then mobile catering could be a natural transition. Where the mobile catering business outperforms street vending is that the food inventory being delivered to the catered event has been spoken for and will be paid for as part of the arrangement. The street vending disadvantage is that there is no guarantee all the sandwiches or other pre-made food items will sell that day. Depending on your food menu, there is going to be some waste as you dispose of unsold items. Catering also removes the uncertainty of weather, a slow day at a vending location and various other issues that can have an effect on the food truck startup business. One more thing to consider before entering the mobile food industry is…can you do it? If you are looking at semi-retirement, you also need to think about all the work that is involved in operating a food cart, kiosk or truck. If you have had experience with fast-paced employment situations, this may be a good fit. If you are thinking about a food truck as a ‘fun hobby’ then maybe it isn’t the best idea for you at this stage in your life. That’s why many older food truck operators hire young helpers to ease the work load. Regardless, there are many rewards to owning and operating your own portable food vending service but they do come at a price. That being said, with the continued growth in the trend for fast, easy and quick meals to take on the run, you may just tap into a great opportunity to change your future.